biggest fan ! – WhatZupBristol! Christmas is all about getting boozy and eating everything in sight – and that’s exactly what this fabulously festive brunch is all about. All you could ever want for Christmas is bottomless Espresso Martinis and avo’ on toast, right? (Yes, I know, so millennial it hurts.) And who needs Santa sliding down your chimney when London’s M Restaurant will deliver the gift? We’ll start by talking about the booze, because that’s what truly matters when it comes to brunch. The drinks menu—which you have 90 minutes to take full advantage of—has everything from Champagne and Bloody Marys, to Negronis and Espresso Martinis. So there should be quite enough alcohol to fuel a tipsy rendition of Fairytale Of New York. The food is where this brunch truly shines, though – and believe me, you’ll need it to soak up the cocktails. Prepared in an award-winning kitchen, you can help yourself to as much as you can manage for the duration of your sitting. There’s the classic avocado on toast with feta and crème fraîche; buttermilk fried chicken with waffles, maple butter and syrup; steak and fried duck eggs; and so much more. If you’re feeling extra fancy, you can even opt for lobster and truffle mac ‘n’ cheese for an extra £10. It’s naughty but oh-so nice. Of course, it’s not all about the food and drink. It is party season, after all. Hosted by a very naughty Santa, you can expect liquor-laced lollies straight from Lapland and tasty candy cane shots. There’ll also be a DJ to get you dancing, and prizes for the best festive dress. 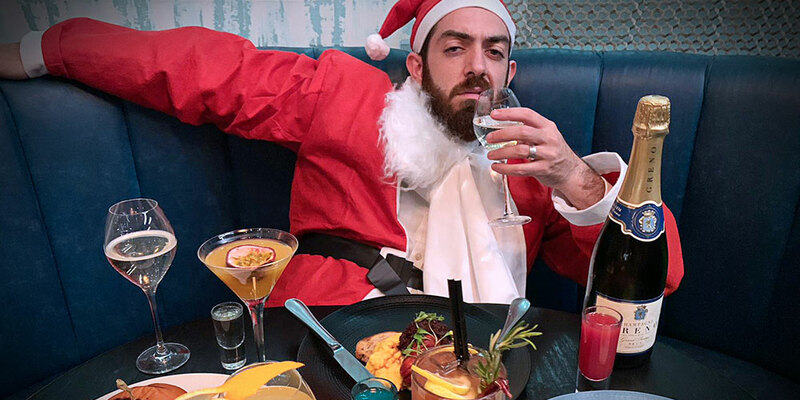 M Restaurant’s Naughty Santa Brunch will take place on Saturdays throughout December, at their Victoria venue. Get your tickets here. The post Enjoy Bottomless Booze And Free-Flowing Food At This Fabulously Festive Brunch appeared first on Secret London.